Yamhill Community Action Partnership (YCAP) will undertake its annual Point In Time Homeless Count on Jan. 30 to measure and record all those in the area experiencing any level of homelessness. The single-day count takes place on the streets and at drop-in centers around the country. YCAP is calling on volunteers to help with the count, which records people living on the streets, in their cars, couch surfing or doubling up in rooms, in shelters or who are sleeping in places not otherwise meant to be a home. Results from the survey are annually used to help local planning and secure future funding for housing and other services for homeless individuals. Those wishing to be counted in the survey can call 211, visit a drop site, visit YCAP or call YCAP at 503-687-148. There are several drop sites in the area, which are also giving out bus passes, food, socks, gloves, tarps and other survival supplies to those who need them. Newberg will host three drop-in sites where people can go to be counted and receive food and supplies: from 8 a.m. to 2 p.m.; at the Youth Outreach office, 719 E. First St; from noon to 4 p.m. at Zion Lutheran Church, 301 S. River St. and from 5 to 7:30 p.m. at River Street Church of God, 715 S. River St.
A site specifically to count homeless veterans will be at the McMinnville American Legion Hall, 126 Atlantic St., from 9 a.m. to 2 p.m. and includes a meal. Veteran service providers will offer resource connections, survival supplies and other resources, such as housing. McMinnville will also hold a drop site at the St. Barnabus Soup Kitchen, 822 S.W. Second St., from 2 p.m. to 6 p.m. Dundee will hold a drop center from 11 a.m. to 3 p.m. at the Dundee Community Center, 1026 Highway 99W. Free transit is also being offered to aid in the count. According to the 2018 effort, which saw more than 60 volunteers participate, a total of 240 people were counted as living in some type of shelter on the night of the homeless count in Yamhill County. That broke down to 97 women, 141 men, one transgendered person and one person that was gender non-conforming. Of those listed, 24 people were fleeing domestic violence. Of the 240, 133 of those sheltered were single-person households and the remainder were part of a multi-person household. Comparatively, 223 people were counted for the 2017 count, and 167 were counted in 2016. This is a 17-person increase from last year and a 73-person increase from two years ago. According to numbers provided by YCAP, there were 417 people counted as living unsheltered in Yahmhill County in the 2018 count: 186 women, 229 men and one transgendered person. Fifty-one of those people were fleeing domestic violence, 268 came from a single-person household and 149 came from a multi-person household. To compare, there were 270 unsheltered people listed in the 2017 count. "While this is a large increase, it may not necessarily reflect a surge in street homelessness over the past year," the YCAP report read. "One possible contributing factor to the larger unsheltered count could be the implementation of YCAP's Coordinated Entry system, which as a single point of access for persons seeking housing services, has allowed YCAP to engage and keep in touch with a large scope of persons experiencing homelessness in Yamhill County." The report continues, saying 729 people were listed as couch surfing in 2018, up from 573 the previous year. The 2018 numbers broke down to 208 women, 310 men, three transgendered people and 11 who declined to answer. Of those, 411 were 18 or younger. 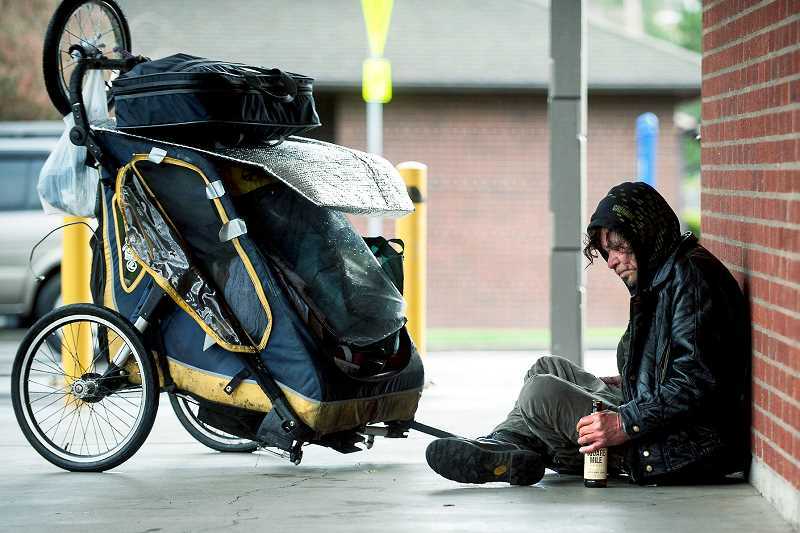 "This increase may be a reflection on the continued strain of the housing market in Yamhill County, causing more persons to double-up or couch surf to avoid a literally homeless situation," the report read. Thirty-seven veterans were counted in 2018 as being literally homeless the night of the count, including 33 men and four women; 13 of those were living in shelters and 24 – including all four female veterans – were living unsheltered. In 2017, there were 33 homeless veterans counted. All told, 1,386 people were counted as experiencing some kind of homelessness the day of the 2018 count. That number is up from 1,066 in 2017 and 1,197 in 2016. The increase was mostly in the numbers of people living unsheltered or couch surging. The report concludes Yamhill County has the seventh highest population by county of people who are literally homeless, the second highest number of people who are homeless and fleeing domestic violence, and the fifth highest number of people are homeless with serious mental illness.